Stampin Carol: Happy Valentine's Day! I hope all you "sweeties" are having a wonderful day and celebrating with loved ones. 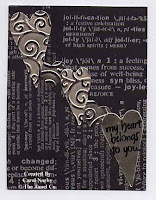 This card is made with metallic glossy paper (from my stash) embossed with a Fiskar texture plate run through my Wizard (Spellbinders) and then using a heart Sizzix die and a heart punch to cut the hearts. I stamped the text (a current GWP called With All My Heart) with Versamark ink and black embossing powder. The pattern paper is from DCWV Black & White Mat Stack. I had to run the X-Static pad over the glossy cs before stamping to help control the embossing powder. After I embossed the hearts I lightly ran my Black Staz-On pad over the cardstock to make the raised swirls show up better. This card was also made with the metallic glossy cardstock (from my stash) and a Fiskar texture plate, the Wizard, and Black Staz-On ink. 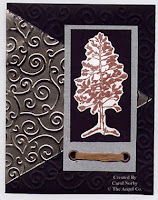 The tree is from the Good Timber set stamped with a Bronze Encore pad on white. This is mounted on black cardstock over grey cardstock the inset eyelets and rafia. I set the eyelets with my Crop-a-dile and the eyelets came in the Crop-a-Dile case. This card was made for a sketch challenge on Technique Junkies, a yahoo group. Pat H. does a great job with newsletters of great techniques and CDs so if you're interested just email me for more information. Pat also has a blog you can check out for some great ideas. Well, my honey and I are going to a Valentine banquet tonight at the Assembly church in Green Valley. I'll give him his special card when he gets home from work today. I was thinking if giving it to him this morning when I fixed his lunchbox but I think I was sleep-walking and went back to bed and slept for another hour. Hugs to all!